Arvind Kejriwal's meeting with Haryana Chief Minister Manohar Lal Khattar today comes after a strange back-and-forth earlier this week; both said publicly that while they were willing to meet to discuss Delhi air pollution, the other side seemed unavailable. 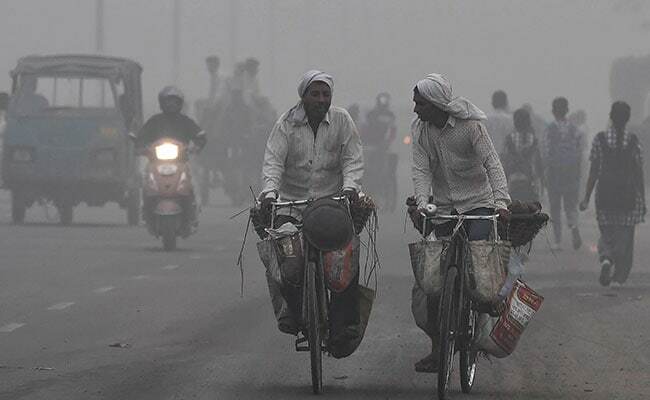 Delhi Air Pollution: Arvind Kejriwal said wrote to Haryana & Punjab CMs requesting to meet for talks. One down, another to go. Haryana has pledged its assistance to Delhi in fighting the toxic smog that has covered the city for over a week, leading doctors to declare a public health crisis. Punjab, the other state whose actions impact the filthy air, has so far ignored Delhi Chief Minister Arvind Kejriwal's entreaty for a meeting to discuss possible solutions. Mr Kejriwal met this morning with his counterpart from Haryana, ML Khattar, who is from the BJP, to toss around ideas on how to protect Delhi in the future from the sort of filthy air that has left residents complaining of headaches, watering eyes and dizziness, and forced the shutdown of all schools last week. The two leaders said in a statement "We agreed upon the need for action on many measures aimed at predicting its re-occurrence in the winter of 2018." The levels of poisonous airborne particles, known as PM 2.5, have been off the charts in Delhi, often crossing 500. How dangerous is that? The upper limit of "good" quality air is 50. "We accept that pollution in Delhi is a concern for the whole country...it is the national capital," acknowledged Mr Khattar who has recently accused Mr Kejriwal of trying to "politicize" the issue to distract from his own government's failures in preventing the toxic smog. The Chief Ministers said they have "jointly identified action points" and are committed to "quick action on a number of fronts." The crisis is a combination of vehicular exhaust, dust from construction sites, and stubble-burning in the agrarian states of Punjab and Haryana which border Delhi. Every year, at this time, farmers set the remnants of their harvested crop on fire to prep their fields for the sowing of the winter crop. The fires send smoke streaming into Delhi. The smog in Delhi has been blamed on dust from construction, vehicle exhaust and the illegal crop burning in Haryana and Punjab. Mr Kejriwal flew to Chandigarh to meet with Mr Khattar after the latter refused to make time for him during a two-day trip to Delhi at the start of the week. The Delhi leader asked to meet while in Chandigarh with Punjab Chief Minister Amarinder Singh, who is from the Congress, but was brusquely refused. Captain Singh said a consult would be pointless as the issue of stopping farm fires needs to be resolved by either the centre or the Supreme Court, which is hearing petitions that ask for its intervention in the fight against Delhi's pollution. Farmers are a substantial vote group and no party wants to risk angering them by enforcing a ban on crop burning. Mr Kejriwal has said he understands and accepts that farmers must be given financial aid if they are ordered to stop farm fires for more environment-friendly options.